gluten and dairy free, too! 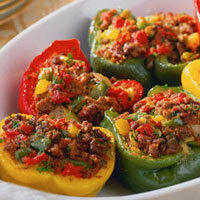 These Kosher Stuffed Peppers are a real crowd pleaser! The Tex-Mex twist makes them so delicious. Some have told me they add beans in place of half the rice and my kids really liked it when I once threw a cup of corn in the mix. They benefit from being both gluten and dairy free. 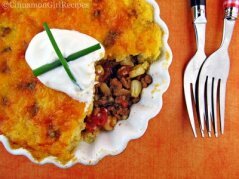 You can also substitue soy based meat crumbles to make this a pareve recipe, one suitable for topping with cheese or serving with sour cream. This dish is a great make ahead recipe because it freezes so well. In fact the peppers will be softer and easier to eat after being frozen. Thaw in the refrigerator overnight before baking. 1. In a large pan, brown ground beef with onion and pepper. Drain fat, stir in water and taco seasoning, cook for an additional 5 minutes, then remove from stove. 2. Preheat oven to 350 degrees. In a large bowl, crumble meat mixture, mix in the beaten egg. Gently stir in the rice and beans or corn if using. 4. Bake in preheated oven for 30 minutes until peppers are soft. 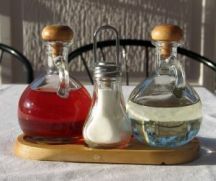 *Mix up an economical batch of your own taco seasoning: 2 tablespoons chili powder, 1 teaspoon each: cumin, paprika, garlic powder, ½ teaspoon cornstarch, onion powder, dried oregano seasoning salt. 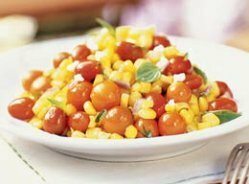 Serve Tex-Mex Kosher Stuffed Peppers with a simple salad of shredded cabbage and bottled or classic homemade vinaigrette salad dressing or this crunchy, colorful Corn and Tomato Salad. This recipe is from The Kosher Channel's collection of Cook Once, Eat Twice Recipes. See more about how the Queen in her kitchen saves time and money with these family pleasing recipes.